Elon Musk's tunneling and transportation startup, The Boring Company, has been selected to construct a high-speed link in Chicago. The route, called The Chicago Express Loop, will run between Terminals 1-3 of Chicago's O'Hare airport, and Block 37 in downtown Chicago. At least, that's the plan. Boring has been selected as the preferred option to build an express route between the airport and downtown by the city. The new line is part of an $8.5 billion redevelopment of O'Hare, one of America's busiest airports, which includes renovated terminals and gates. It's thought that, when running, the journey will take 12 minutes between the two stops, with fares expected to cost between $20 and $25. TBC was the preferred bidder from a number of companies that pitched for the contract, and will now enter into formal negotiations with the city. When a deal has been thrashed out, a vote on the agreement will be put before Chicago's city council, after which point, construction can begin. The Chicago Express Loop will utilize Boring's "Loop" concept, itself distinct from Musk's Hyperloop idea which Boring is also developing. 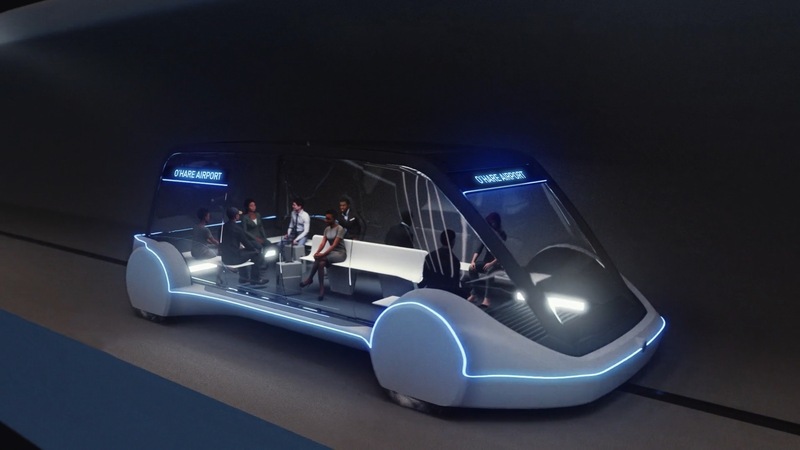 This loop is the one in which passengers will ride on electric skates that are said to travel at speeds up to 150 miles per hour. So, just to be clear, that's a Chicago Loop loop using Loop not a Hyperloop loop, okay? Each capsule will, essentially, be a Tesla Model X that runs on rails, albeit big enough to hold between 8 and 16 passengers. The hope is that the service will run every 30 seconds, and be in operation for 20 hours a day, every day. According to the Chicago Tribune, there are plenty of details still to be worked out, including the proposed route the tunnels will take. The paper's sources believe that Boring's preferred route would be to run west from Block 37, before turning north to run below the Kennedy Expressway, Halsted Street and Milwaukee Avenue. The route would then, after some time, turn back west to go to O'Hare. 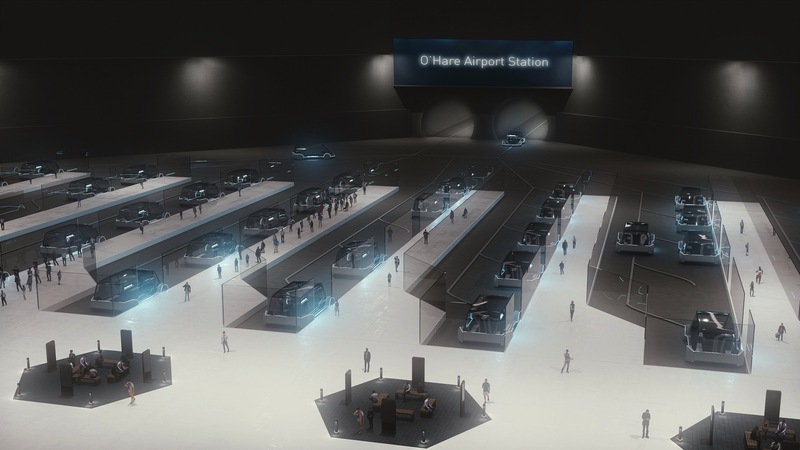 Chicago has selected Elon Musk's Boring Company to build high-speed transit tunnels between the Loop and O'Hare. If you're unfamiliar with Chicago history, Block 37 is the nickname for 108 North State Street, a large development in the city's downtown. The name comes from the fact that it sits on one of the original 58 blocks that were designated for the city, and houses a large entertainment and business complex. The site was expected to grow to include a large transit station in the basement that included a link to O'Hare. The deal would see The Boring Company take over some interest in the transit station beneath Block 37 and fund its completion. It's not clear if the site would, as originally planned, include links to Midway airport and connections to both the Blue and Red subway lines. It's thought that the whole project will cost less than $1 billion, and The Boring Company claims that it will finance the entire project itself. In a statement, an unnamed representative said that TBC had been selected to "design, build, finance, operate and maintain an O'Hare Express service." It will be a challenge for Musk's company, which has little-to-no experience in building a mass transit system of this caliber and importance. And, of course, it comes at a crunch time for the billionaire, who has experienced pushback on another Boring Company project in LA. Not to mention the sustained production issues that have plagued his car company Tesla as it attempts to scale up to becoming a mass-market auto company. Cynics may point out that Musk's strength has been to align his business interests into sectors where he can leverage government subsidy. They may have to change their tune if TBC does manage to build a working and reliable express route without a penny of public cash. Although we imagine that it will receive benefits in kind, like the land beneath Block 37, in order to get the system working. Mariella Moon contributed to this report.